现在，我受全国人大常委会委托，向大会报告工作，请予审议。 On behalf of the Standing Committee of the National People's Congress (NPC), I now present to you this report on the work of the Standing Committee for your deliberation. 中国共产党的领导是中国特色社会主义最本质的特征，是中国特色社会主义制度的最大优势。常委会始终把坚持党的领导贯彻于人大工作的各方面、全过程，坚持党中央的集中统一领导，自觉在思想上政治上行动上同以习近平同志为总书记的党中央保持高度一致；始终坚持正确政治方向，统筹安排和推进人大立法、监督、决定、任免、代表、对外交往、新闻宣传以及理论研究、联系指导地方人大等各项工作和活动，保证党的路线方针政策和决策部署在国家工作中得到全面贯彻和有效执行，保证党通过国家政权机关实施对国家和社会的领导。 Leadership by the Party is the essential feature of socialism with Chinese characteristics, as well as its greatest strength. We have incorporated the leadership of the Party into every process and aspect of the NPC's work, upheld the centralized, unified leadership of the CPC Central Committee, and ensured that our thinking, actions, and politics all maintain a high degree of unity with the Central Committee headed by General Secretary Xi Jinping. In coordinating the NPC's initiatives and activities concerning legislation, oversight, decision making, personnel appointments and dismissals, deputies, foreign relations, information and publicity, theoretical research, and contact with and guidance over local people's congresses, we have maintained the right political direction and worked to ensure that the Party's line, principles, policies, decisions, and plans are fully and effectively implemented in the work of the state, and that the Party can exercise leadership over the state and society through the organs of political power. 一、重点领域立法迈出新步伐 1. We made new strides in key areas of legislation. 法律是治国之重器，良法是善治之前提。常委会抓住提高立法质量这个关键，着力推进重点领域立法，立法工作呈现出数量多、分量重、节奏快的特点，取得了一批新的重要成果，支持和推动了改革发展稳定。 The law is of great value in the governance of a country, and good laws are a prerequisite for good governance. Focusing on the key task of raising the quality of legislation, we channeled great effort into advancing legislation in key areas. Large in number, considerable in weight, and rapid in pace, our initiatives in legislation led to a number of important achievements that have supported and promoted the country's reform and development and ensured its stability. 反恐怖斗争事关国家安全、事关人民切身利益、事关改革发展稳定全局，在当前国际国内反恐怖形势严峻复杂的背景下，加强反恐怖主义工作尤为重要。常委会于2015年12月通过反恐怖主义法，确定了我国反恐怖主义工作的基本原则，健全了工作体制机制，强化了安全防范、应对处置、国际合作和保障措施。在常委会通过的刑法修正案（九）中，将五种恐怖相关活动列入刑事追责范围，加大了对恐怖主义、极端主义犯罪的惩治力度。完善反恐怖主义相关法律，对于依法防范和惩治恐怖活动，维护国家安全、公共安全和人民生命财产安全，具有重要意义。 The fight against terrorism has an important bearing on China's national security, on the people's immediate interests, and on the country's reform, development, and stability. In the face of a grave and complex situation in the fight against terrorism both at home and abroad, it is of crucial importance that China intensifies its anti-terrorism initiatives. With this in mind, the Standing Committee adopted the Anti-Terrorism Law in December 2015, through which we have defined the basic principles of China's anti-terrorism initiatives, improved working systems and mechanisms in this regard, and stepped up anti-terrorism efforts with regard to preventive safety measures, emergency response, international cooperation, and supporting measures. Meanwhile, Amendment IX to the Criminal Law, passed by the Standing Committee, imposed criminal sanctions against five types of terrorism-related activities and introduced harsher punishments for crimes involving terrorism and extremism. The improvements to our counter-terrorism laws will be of great importance for preventing and punishing terrorist activities according to law, for safeguarding national and public security, and for protecting people's lives and property. 老百姓吃得放心才能舒心。为了建立最严格的、覆盖全过程的食品安全监管制度，针对食品安全领域存在的突出问题，常委会及时修订了食品安全法。这次修订，突出预防为主、风险防范，进一步完善食品安全风险监测、评估和安全标准等基础性制度，实施食品生产、流通、餐饮服务全过程监管，强化对违法生产经营、监管失职渎职等行为的法律责任追究，建立包括有奖举报、信息发布、责任保险等在内的食品安全社会共治体系，动员全社会力量依法严守“舌尖上的安全”。 The people will not be content until they have confidence in the safety of the food they are eating. In a bid to establish the strictest possible oversight and supervision system for food safety, one that covers the whole process from production to consumption, the Standing Committee took prompt steps to revise the Food Safety Law, taking particular aim at prominent food safety problems. With an emphasis on preventing and reducing safety risks, the revised law has improved basic systems pertaining to safety standards and the monitoring and assessment of safety risks. It brings the whole process from food production and distribution to catering under supervision, and tightens legal penalties for the unlawful production and sale of food and for neglect and dereliction of food safety supervision duties. It also prescribes the establishment of a society-wide co-governance system for food safety that comprises the provision of rewards for reporting food safety problems, the release of food safety information, and the introduction of a food safety liability insurance, so that every member of society is encouraged to lawfully ensure that every bite of food is safe. 反对家庭暴力是社会文明进步的重要体现，是维护家庭和谐、社会稳定的必然要求。习近平主席2015年9月在全球妇女峰会上明确提出：“我们要努力消除一切形式针对妇女的暴力，包括家庭暴力。”常委会制定的反家庭暴力法，强调反家庭暴力是国家、社会和每个家庭的共同责任，明确了家庭暴力的预防和处置机制措施，创设了人身安全保护令等制度，为推动解决妇女、未成年人等群体遭受家庭暴力问题，维护平等和睦文明的家庭关系，提供了更加完善的法律保障。 Opposition to domestic violence is an important indicator of social progress, and an essential requirement for harmonious families and a stable society. In September 2015, at the Global Leaders' Meeting on Gender Equality and Women's Empowerment, President Xi Jinping stated, "We will strive to eliminate all forms of violence against women, including domestic abuse." The Anti-Domestic Violence Law formulated by the Standing Committee emphasizes that the prevention of domestic violence is the shared responsibility of the state, society, and each family. The law has not only stipulated mechanisms and measures for preventing and dealing with domestic abuse, but has also introduced a system of restraining orders to protect the victims of family violence, thereby providing a stronger legal guarantee for preventing domestic violence against women, minors, and other groups and preserving equal, harmonious, and amiable family relations. 及时修改人口与计划生育法。贯彻党的十八届五中全会关于“全面实施一对夫妇可生育两个孩子政策”的决策部署，常委会作出关于修改人口与计划生育法的决定，自2016年1月1日起实施“全面两孩”政策。修改后的法律明确规定：国家提倡一对夫妻生育两个子女；在国家提倡一对夫妻生育一个子女期间，自愿终身只生育一个子女的夫妻，国家发给《独生子女父母光荣证》；获得《独生子女父母光荣证》的夫妻，按照规定享受奖励、获得扶助。这次修改，是适应我国人口发展出现的重大转折性变化，对生育政策作出的重大调整。这对于促进我国人口均衡发展将产生广泛而深远的影响。 We also made timely changes to the Population and Family Planning Law. 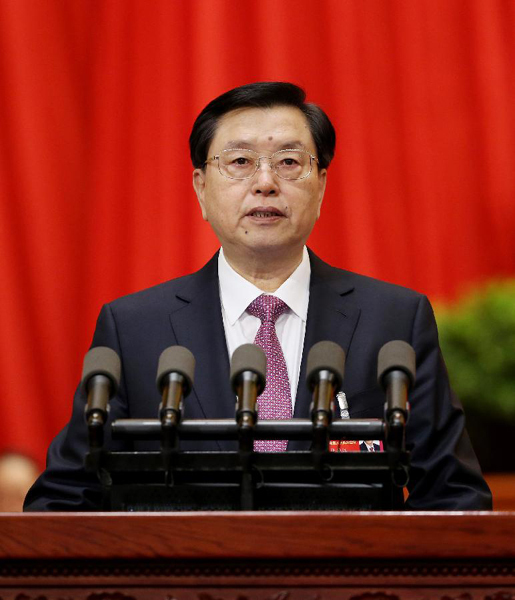 In order to put into effect the decision made at the Fifth Plenary Session of the 18th CPC Central Committee to comprehensively implement a policy of allowing all couples to have two children, the Standing Committee issued a decision on revising the Population and Family Planning Law, implementing a universal two-child policy as of January 1, 2016. The revised law explicitly stipulates that all couples are allowed to have two children. Those couples who had observed the previous one-child policy and are still willing to have only one child in their lifetime shall be eligible for a certificate of honor, which entitles them to benefits and assistance as stipulated. As a response to the major demographic shift that has taken place in China, the revision of the Population and Family Planning Law represents a major change to China's birth policy, and is a move that will have far-reaching effects on our efforts to promote the balanced development of China's population.